Hey Guys and Gals. I know its been a while, life has been very busy for me and keeps getting in the way of a good post. I have finally been able to get back on the board and do some cooking worthy of posting. I was very excited to make this as those who know this recipe know it originated from the great Massimo Bottura who wanted to utilise the near 1000 wheels of cheese damaged in the disaster after an earth quake devastated the Emilia-Romagna region of Italy in 2012. The great man is coming to Perth in August and I managed to get tickets to his show. So I decided to try his nice simple recipe from the three Michelin Star and elBulli Chef, Massimo Bottura. 1. To make the parmesan broth: Combine the parmesan with 8 1⁄2 cups of water in a large stockpot over a medium-low heat. When the cheese becomes stringy, remove it from the heat. Let it cool down to room temperature and repeat the heating once more. Refrigerate the broth for at least 8 hours or overnight. The next day, the broth should have separated into 3 distinct layers: a cream layer, on top; a broth layer, in the middle; and a solid layer, on the bottom. Carefully remove the top cream layer and reserve. Strain the broth, discarding remaining solids. 2. To make the risotto: Heat the broth in a large saucepan over medium heat, set aside and keep warm. Heat the butter in a medium saucepan over a medium heat, add shallots and garlic, then cook, stirring, until soft. Add the rice, cook for 2 minutes. Add the reserved stock one ladle at a time. Cook until each addition of stock is absorbed before adding another. Stirring often, cook until the rice is tender and creamy, about 20-22 minutes. Stir in the parmesan cream and cracked pepper then garnish with parsley leaves if you really want – I also grated some extra parmesan as it is one of my favourites. Enjoy! I love rabbit! So when I received Cape Mentelle’s monthly newsletter I just had to give this one a try. I used the base of the recipe however adapted it into a full ragoût (Link for original recipe at bottom of the post). I was making this ragoût whilst I was making Shannon Bennett’s Master Chef Australia challenge and this made it a lot easier for me to cook as I had to make this between all the elements of the other dish. It was very tasty and if you have never had rabbit before I highly recommend it. 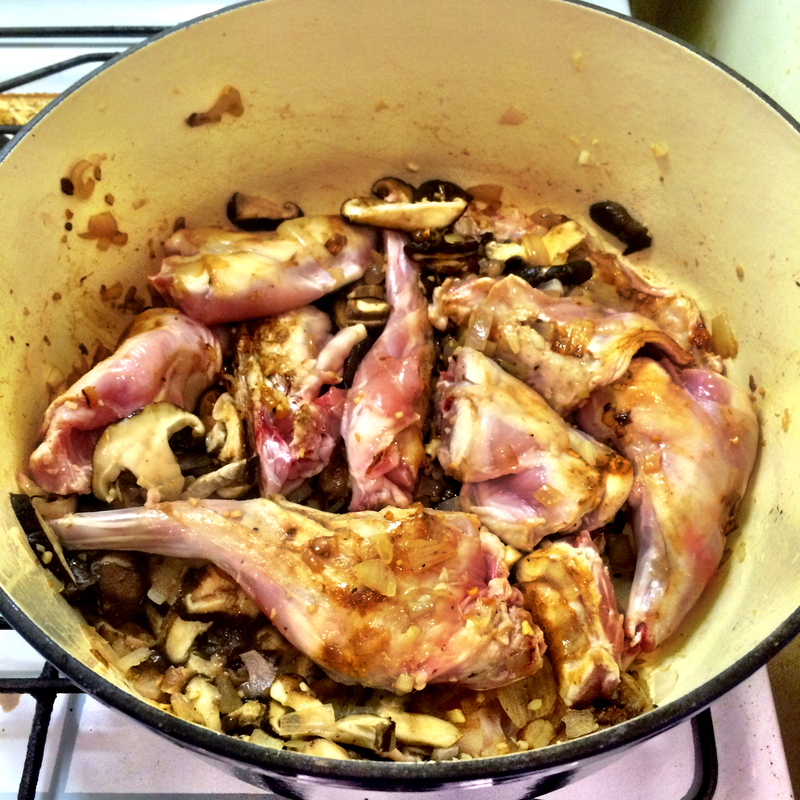 1: In a large saucepan, brown the rabbit pieces and set aside. 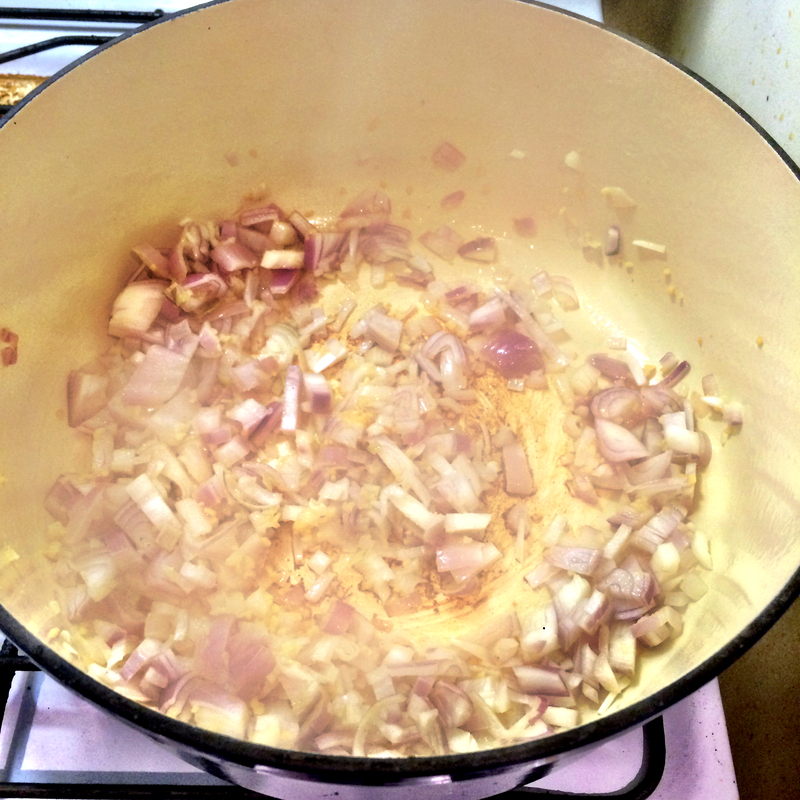 2: In the same saucepan, cook the garlic and shallots until fragrant. 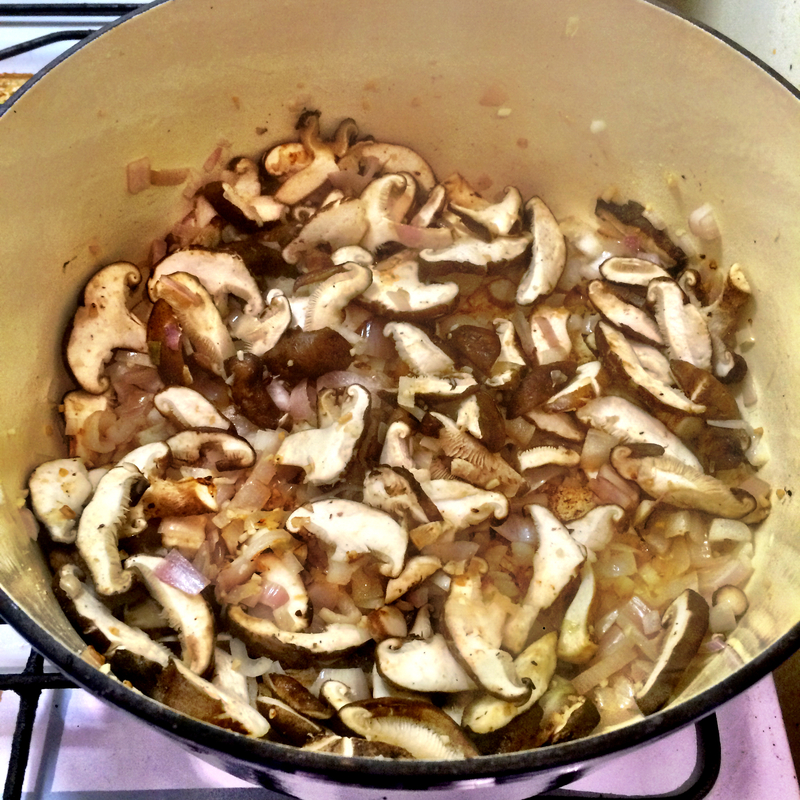 3: Add the mushrooms and sauté until the start to soften. 4: Next return the rabbit to the saucepan. 5: Add the white wine and whilst bubbling scrape the bottom of the pan to lift all the flavors. 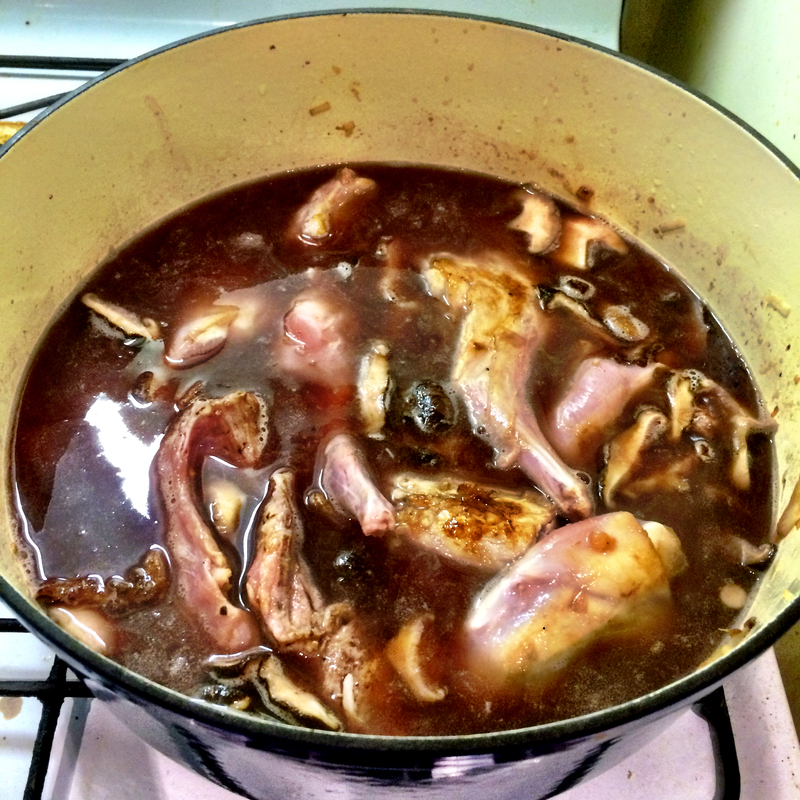 6: Add the red wine and stock and bring to the boil. 7: Reduce to a simmer and cook for 1 hour and 15 minutes or until the meat is falling from the bone. 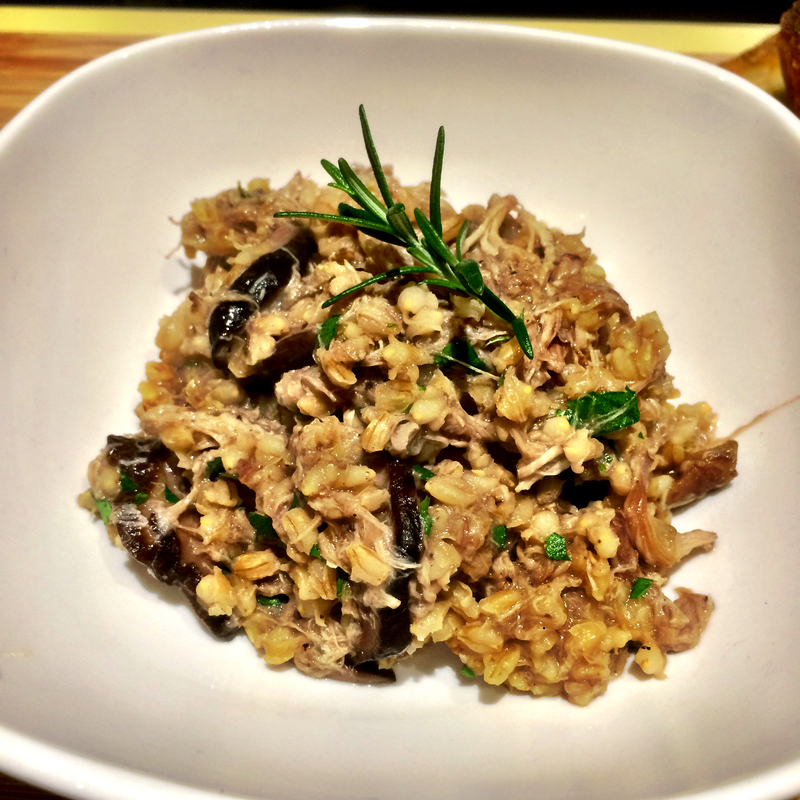 8: At the halfway mark add your pearl barley. 9: Once the meat is starting to fall off remove the pieces carefully with tongs, remove all the bones, return the meat to the saucepan and add the chopped rosemary. 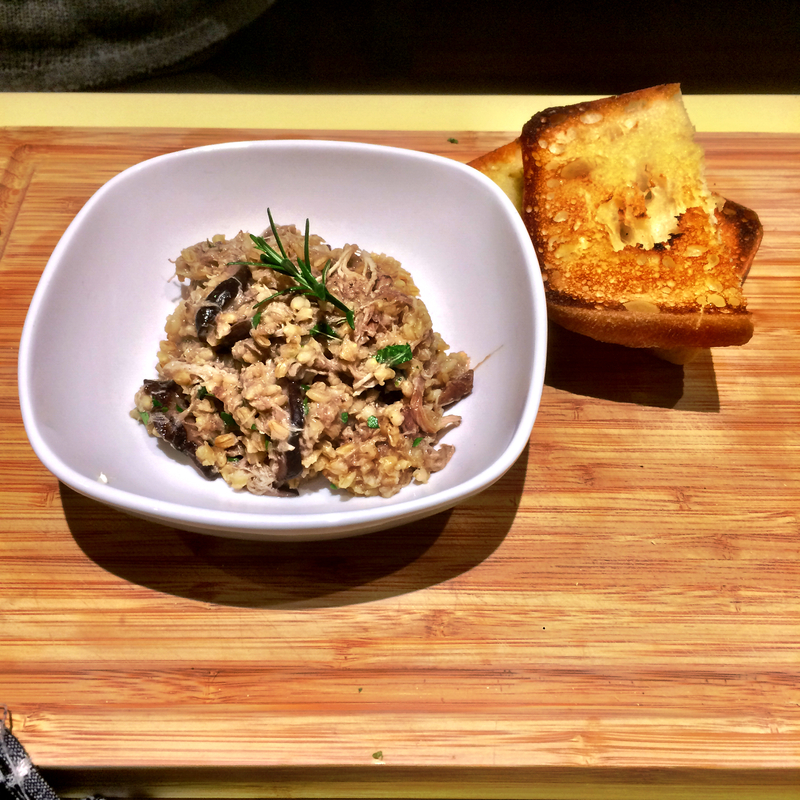 10: If the pearl barley needs a little more time taste it at every 10 minute intervals until cooked to your liking. 11: Once the barley is cooked, spoon into a bowl, garnish with the rosemary tip and serve with a nice slice of toasted crusty bread. Enjoy!